Welcome to Comedy Island, a land where laughs are made and relationships are tested! This month we're back at Relapse Theatre for an exciting night of trial by laughter. 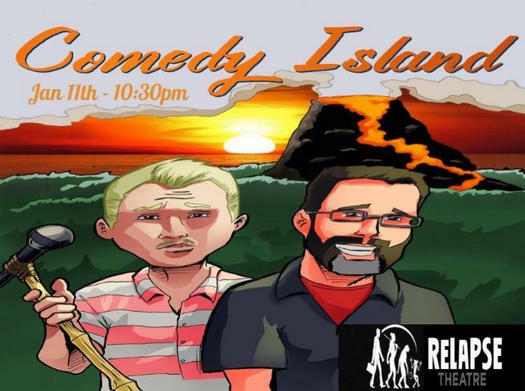 Comedy Island is a comedy competition based around the reality TV show Survivor. The show begins with six comedians who will go through five unique rounds to test their range of writing. The rounds will consist of ‘pun-liners’, impressions, roasts, crowd work, and stand up. After each round, the crowd votes for a winner for that round. The chosen comedian is granted immunity, and the remaining comedians must vote someone off of the show. This process will be repeated for the following rounds until there are two comedians left. The final two comedians each perform a five minute set, from which the crowd chooses a winner.